The Computerized Mr. Jones — Can a machine be conscious? 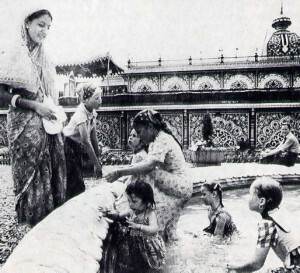 In Limestone, W.Va. , young Hare Krishna devotees cool off in fountain in the gardens surrounding the group’s Palace of Gold. a memorial to A. C. Bhakti-vedanta Swami Prabhupada. 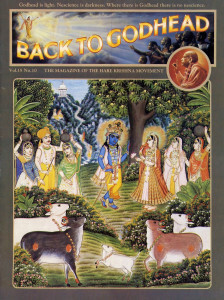 who brought Krishna consciousness to the West. The men in saffron robes, in denims and faded shirts, heads shaven and unshaven, the women in saris of many colors, the Hare Krishna devotees came in twos and threes and troops, afoot and in Jeeps and in panel trucks; and old cars. And as they rounded a bend in the narrow mountain road they beheld, rising like a mirage above the trees here in rural West Virginia, the gold-leafed domes and spires of a vision of spectacular opulence, the Palace of Gold, whose construction they had come to celebrate. From across the United States and from Canada, Mexico and India as well, many of these members of the International Society for Krishna Consciousness were arriving to join a 300-member community of the faithful here for the second annual Prabhupada Summer Festival, which ends tomorrow. It has also been proclaimed by some to be a grand opening of the palace, though their swami described it as only a preview for a grand opening scheduled for Labor Day weekend. The palace is the first of many religious shrines to be built here in a community the devotees have named New Vrindavan, for a sacred city of temples in India. However they regarded the occasion, visitors stared with awe as if at a miracle of creation atop a ridge overlooking miles of forests and fields, foothills and valleys. But again their spiritual leader, Srila Kirtanananda Bhaktipada, was more restrained. The rain showers marred opening festivities late yesterday when an opening address by the swami and a vegetarian feast, both scheduled for the grassy hillsides, were driven under shelter. But today, unperturbed, the devotees resumed, from before dawn till after dark, their three days of rituals and seminars, interspersed with strolls to the palace and visits to a bazaar under a multicolored canopy, much like a country fair, where they could buy refreshments and visit educational booths and stalls selling their literature. This is the second of three celebrations of the construction of the palace. The first, last September, was a dedication. When the third occurs, on the occasion of a festival named Janmastami over the Labor Day weekend, the finishing work will still be continuing, with devotees bending and carefully brushing gold leaf onto intricate relief work of walls, columns and steps. On a site that was once a garbage dump, the devotees were climbing broad steps to walled terraces looking down on development of a Garden of Time to be dotted with fountains symbolic of phases of human life and out over construction work on a restaurant and museum toward broad acres on the ridge top where still another garden is to be created. As they walked they chanted the names of deities. Over all this rises the ornate palace, built as a memorial to A.C. Bhaktivedanta Swami Prabhupada, the Indian scholar who brought his translations of ancient scriptures in 1965 and began the Hare Krishna movement in this country. Its black and gold leaf walls, inlaid with Italian onyx, are pierced through with intricately decorated stained glass windows, and they support gold and black domes, all an amalgam of Eastern and Renaissance architecture. Inside, crossing marble floors in geometric mosaics under mirrored ceilings, the devotees finished two shrines to Prabhupada, who died a few years ago. One is a suite in which sits a couch he once used, adjoining a study where a lifelike figure of the sainted Prabhupada bends over a marble table as if to work on a translation. Adjoining is an onyx, teak, marble and gold bathroom. The other is a central court, a sacred room where the devotees in small groups knelt and prostrated themselves before another statue, a gold figure of Prabhupada seated on a gold throne under an ornately carved cupola. Overhead the domed ceiling is decorated with paintings depicting the life of their Lord Krishna, including one showing him casting out demons. All the construction is the work of a small community living on 2,000 acres of the rural countryside and executed in their own craft shops. It has about 300 members now, who have raised by their own efforts the $500,000 spent on it thus far.